Gather your materials. You will need some contact paper, painter’s tape, a marker and buttons. Start by attaching the contact paper to the wall. Painter’s tape works great and won’t muck up your walls. Write numbers on the contact paper. I welcomed my mini math whiz to check out what I was doing in the hall. She started by tracing the numbers and noticing how hard that it to do with contact paper’s sticky surface. Next she added and added and added buttons. Stopping to count from time to time. She noticed that one button was exactly the same color as her sweatshirt. She kept adding and talking about the numbers she was creating. I loved when she noticed that she needed either one large button or a few little ones to finish off a number. Good little lesson there! 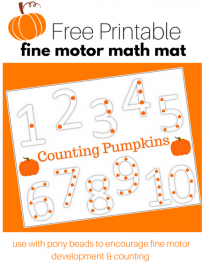 If your child does one number and is excited that’s great. I originally asked her to choose her favorite and then was going to ask her to choose her next favorite but she just kept going. Go with the flow and look for those little unexpected lessons like color matching and size. No matter what celebrate ! All of our book lists include affiliate links to Amazon.com . 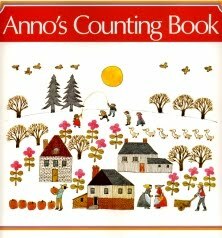 Anno”™s Counting Book by Mitsumasa Anno almost didn”™t make it into my library bag. I am so glad it did. This is a wonderful book full of possibilities. There is no text just simple aerial illustrations of a field as it evolves one number at a time. 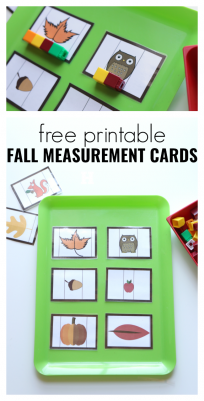 The field fills up quickly and it can be tricky to classify the pictures on each page to match it with the number displayed but once you do , each page is a lesson! Doggies by Sandra Boynton has been one of my daughter”™s favorite books for ages. If you aren”™t familiar with it, it”™s a simple counting book about dogs, their different barks and one pesky cat. Toddlers love barking along with it so it”™s a great book for places where they don”™t have to be shushed, it”™s not a great one for quiet only places like a church service. 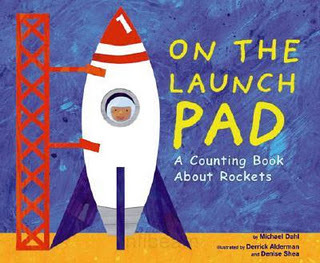 On the Launch Pad: A Counting Book About Rockets by Michael Dahl was a great find, my son loved counting down from 12-1 with the bright illustrations , simple text and hidden numbers on each page. Something that seems simple but was really awesome was that each page had the number written as a word, shown as a digit and as dots to count. You can take the time to count each dot, read the word or simply recognize the digit! 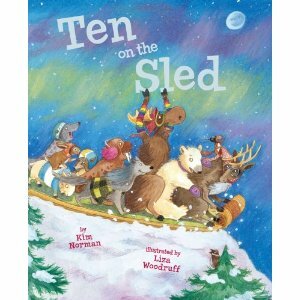 Ten on the Sled by Kim Norman is a really fun and educational book. The book is a new spin on the old song ” Ten in A Bed” but instead of squeezing onto a bed these cold weather animals pile on and off the sled one at a time. What is wonderful from an educational sense is not just the obvious counting element but as each animal exists the sled the verb used for how they exit begins with the same letter as the animal does. My daughter and I read this last night and even though she knows there is a moose and a caribou on the sled she insisted they were reindeer. We stopped each page to count and double check that the correct number of animals were on the sled. It took forever to read and might just have been a kid led tactic to make bedtime stretch out but I can’t say no to counting. We LOVE Ten On a Sled! It is one of our favorite books my son is known to shout “Great thunder! Duck under!” Spontaneously and I laugh every single time I can’t help it. I will definitely look for that rocket book he is very into space ships and rockets lately. Your ideas never cease to amaze me! This looks so fun. 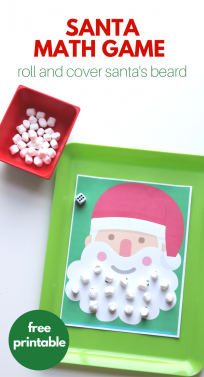 And I just got my hot cocoa cups laminated this morning so I can introduce my little to addition this afternoon (Hot Cocoa Math!). Thank you!!! I love the Button Numbers activity. My son is 7 so I am going to make it look like a phone. After he does a little “research” on what goes where on each phone button, he is going to use it to memorize important phone numbers!! It will also give me the opportunity to discuss and teach phone etiquette!! Did you glue the buttons? nope they just stuck on the contact paper, it’s sticky! I love that picture of your daughter at the end! She looks so pumped! I have some random contact paper and this will be right up my daughter’s alley. She loves buttons and here’s my excuse to go buy some pretty ones at Hobby Lobby.